Physical therapist assistants work under the direction of a licensed physical therapist helping patients recovering from serious illnesses or injuries. Treatment is designed to alleviate pain, improve or recover movement, and prevent permanent injuries. The patients physical therapist assistants may assist include people recovering from serious accidents, heart attacks, strokes, head or spinal injuries, or immobility resulting from birth defects. Physical therapist assistants teach patients exercise techniques, perform massages, utilize electrical stimulus treatment, and show patients how to use ice and heat treatments. After treatment, they keep records of patients' progress and reactions to therapy for the physical therapist's use and to determine future treatment. Physical therapist aides conduct their work under a physical therapist or under the direction of a physical therapist assistant. They primarily prepare rooms for treatment and cleanup once treatment has been completed. They also help patient who require help walking or moving. They do not perform the same tasks as physical therapist assistants since they not licensed. Physical therapist aides also have administrative responsibilities such as handling insurance information, answering calls, and reordering supplies. Their duties are frequently determined by clinic size, location and type of clientele. Physical therapist assistants usually work 5 day weeks during normal business hours. Some are required to work nights and weekends, especially those employed at private clinics and outpatient facilities. Working as a physical therapist assistant can be physically fatiguing. They frequently stand for hours at a time, lift heavy loads, crouch, and kneel. There are several education and training requirements to become a physical therapist assistant or aide. To qualify for physical therapist assistant positions, you must earn an associate's degree from an accredited program. In the majority of states, physical therapist assistants must be licensed to assist patients. Licensing requirements differ by state. The minimum requirement for becoming a physical therapist aid is typically a high school diploma or GED. Currently, ther are over 300 CAPTE (Commission on Accreditation of Physical Therapy Education) accredited associate degree programs for students seeking to become physical therapist assistants. Completing an degree from any CAPTE accredited program will qualify students for state licensure application. A typical associate degree in physical therapy assisting lasts 2 years. Basic course curriculum will likely include human anatomy, psychology, phsysiology, math and English. In addition to traditional classroom study, most programs also provide students clinical work where they'll gain hands-on experience in physical therapy techniques, methods and procedures. Physical therapy assistant students also learn basic first-aid skills and CPR. Once graduated, physical therapists assistant will gain additional hands-on experience through on-the-job training. Even though physical therapist assistants work directly with patients, employer prefer hiring applicants who are tech savvy and understand how to use a computer and technology within a physical therapy environment. Certification and licensure for physical therapist assistants is now required in all 50 states. Licensure not only requires completion of an accredited physical therapist assistant associate degree program, it requires applications to pass the National Physical Therapy Exam for physical therapist assistants. This exam is offered through the Federation of State Boards of Physical Therapy. Licensure requirements vary from state to state. Some states also require applicants to be at least 18 years of age and pass a criminal background check. Licensing in most states also requires physical therapist assistants to complete continuing education coursework. Unlike physical therapist assistants, physical therapist aides are not required to be licensed. The median salary for physical therapy assistants is just under $55,000 a year. Half of physical therapy assistants make more than $55,000 a year, while the other half make less. The top 10% of physical therapy assistants earn over $75,500 a year and bottom 10% have an annual wage less than $32,000. Physical therapy aides make less than physical therapy assistants. The median pay for physical therapy aides is roughly $25,000 a year. The top 10% make over $37,000 a year, while the lowest 10% of earners make less than $18,000 a year. The following table shows the median annual pay for physical therapist assistants by industry. The following table shows the median annual pay for physical therapist aides by industry. 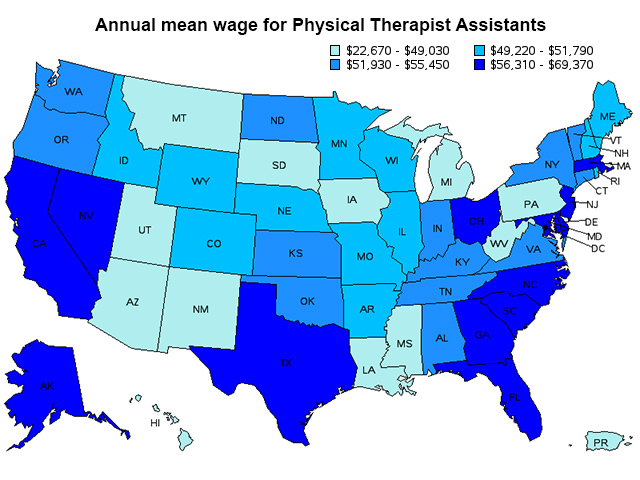 The following map shows the annual mean wage of physical therapist assistants by state. The table below shows the statistics for the 5 states where pay and compensation for physical therapy assistants is highest. Top paying industries and job markets for physical therapy assistants. 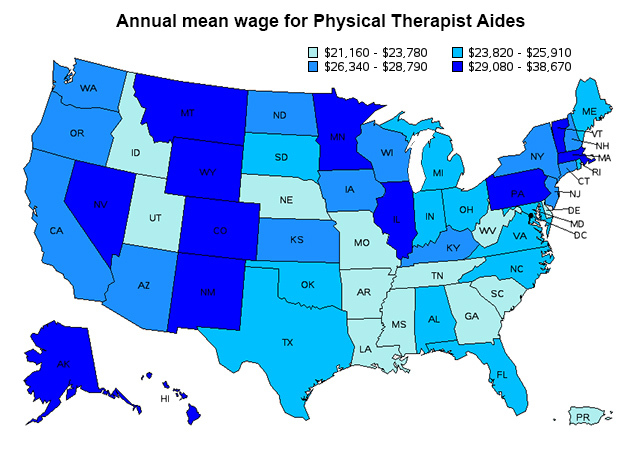 The following map shows the annual mean wage of physical therapist aides by state. The table below shows the statitics for the 5 states where pay and compensation for physical therapy aides is highest. Top paying industries and job markets for physical therapy aides. Physical therapist assistants and aides typically work full-time 40 hour work weeks. Those working with hospitals and physical therapy offices may be required to work irregular hours to accommodate the schedules of their patients. Physical therapy assisting is projected to be one of the fastest growing employment sectors over the next decade. Through 2024, physical therapist assistant employment opportunities are projected to grow by 41% – substantially faster than the projected growth rate for all other occupations over the same time period. With a projected growth rate of 39%, job prospects for physical therapy aides will almost as strong. The overall job market for physical therapy is expected to be strong through 2024. An aging population of baby boomers, increased access to insurance markets and a focus increased activity later in life will all drive demand for physical therapy services. The baby boomer generation is also entering that phase of life where strokes and heart attacks are an increasing risk and cardiac and physical rehabilitation are required. Other conditions that are on the rise, including diabetes and obesity among others, will drive demand for physical therapy services. As our population ages, they'll face a decrease in mobility and seek the therapeutic services of physical therapists and physical therapy assistants. Advances in medicine and medical technology are allowing more injury and trauma victims to survive than ever before, whereby creating additional demand for physical therapy services. To reduce the cost of physical therapy, physical therapists will become increasingly dependent on the services of well-trained physical therapy assistants & – especially in long-term care environments. Physical therapists will continue to design the therapy treatment plans for their patients, but will rely more heavily on the ongoing support of physical therapy assistants to implement the plans. Additional information about physical therapist assistant careers can be obtained from the American Physical Therapy Association (APTA).